The Gallia County Convention and Visitors Bureau has launched a new online photo contest, #VisitGallia2K15. It is designed to encourage community members and guests to Gallia County to share their summer experiences. GALLIPOLIS — With the summer season in full swing, the Gallia County Convention and Visitors Bureau has launched a new online photo contest, #VisitGallia2K15. “The contest is designed to encourage community members and guests to Gallia County to get out and share their summer experiences from events to attractions to their favorite places to eat or shop on our Instagram, Twitter, Vine and Facebook accounts,” said GCCVB Executive Director Amanda Crouse. 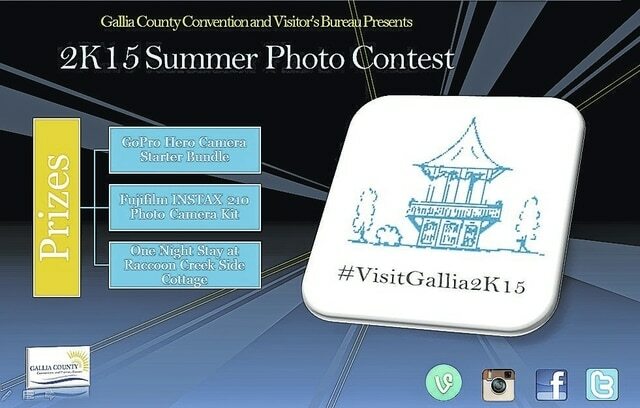 #VisitGallia2K15 is a photo and video contest that will have guests posting pictures of themselves or family members at their favorite destinations throughout the summer. Each time a photo is posted (two entries per day, per person), that individual will be entered into a prize drawing, with a winner being announced Aug. 15. There are three prizes for three winners; a GoPro HERO Starter Bundle that includes a GoPro Camera, memory card and Head Strap; A Fujifilm INSTAX 210 Instant Photo Camera Kit with 10 exposures included; and a free overnight stay at Raccoon Creek Side Cottage located in Vinton, owned and operated by Flem and Donna Dewitt. Though photos are being submitted by both professionals and amateurs, the intent of the contest is participation and highlighting the best of Gallia County. “Too often on social media sites, we see negative things tearing down our community when what we really need to post are the positive things about our home and lift those up for all to see,” Dummitt said. People who may be interested in participating in the contest can contact the GCCVB office to receive more information at 740-446-6882, or find them on Facebook at VisitGallia2K15 Photo Contest. Those using Instagram, Twitter and Vine will need to include the hashtag “#VisitGallia2K15.” Be sure to check privacy settings to ensure submitted photos are being displayed correctly.